One of my favorite things about visiting a grocery store is the samples that are available throughout. If I time my trip to the store just right, I don’t even have to cook when I get home! On a recent shopping trip, the store was providing samples of an organic potato chip and they were really good. The problem? The sampling table was set up in the frozen food section. The sampler had run out of her product supply and was sending customers across the large grocery store to the organic food section. As much as I liked them, I didn’t buy them because I didn’t want to go to the effort to hunt them down. Had the chips been at the ready I’m sure I would have bought. The collection of customer preference needs be handled in the same way – you have to make it easy for your customers to tell you what they want. A key to encouraging opt-in is by tying it to specific customer behavior. 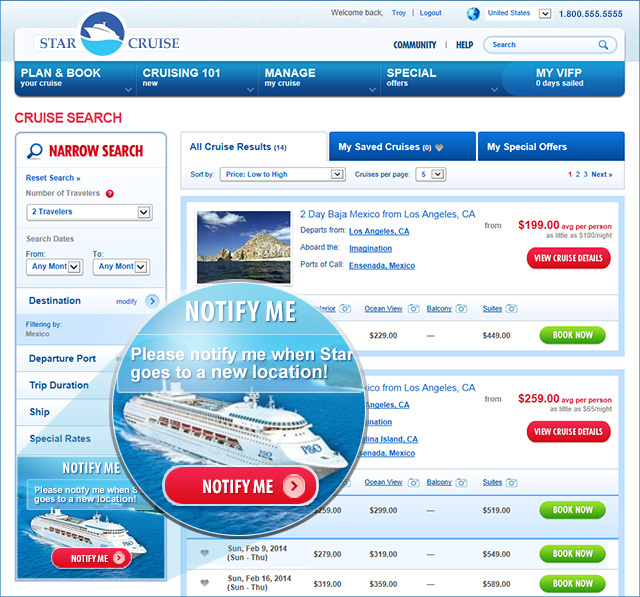 The 'notify me' prompt allows customers to "opt-in" after searching for a destination. When you approach preference collection in this manner, you can replace the messaging and use A/B split testing to determine the success or failure in terms of how many customers opt in or opt out for each option. From that data you will start to recognize customer patterns and target messages to your customer groups more accurately. Let customers create experiences that suit their specific needs. Use what they sample as a way to determine what full product should be on the shelf nearby to help close the sale.